House Wrens have been uncommon at Cedar Creek, but have been increasing and since 1987 have been common. Jeff Burns attempted to study House Wrens at Cedar Creek in the 1970's but was unable because of their scarcity. 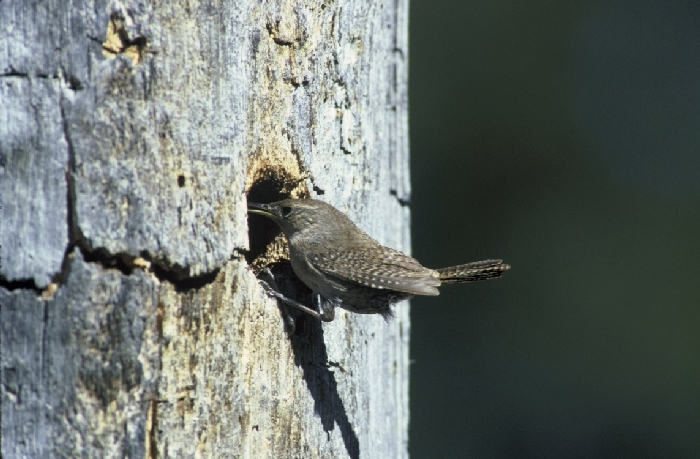 They build nests in practically any available cavity. They are especially common along the edges of the many marshes at Cedar Creek, using old chickadee nests and natural cavities. Winter Wrens are uncommon migrants at Cedar Creek. During spring and fall there is occasionally one in the thick vegetation along the trail just south of Cedar Bog Lake. Sedge Wrens are summer residents along some of the larger sedge meadows and marshes at Cedar Creek, notably along the south shore of the huge marsh south of Fish Lake, the large marsh southeast of the lab, and the marsh along Cedar Creek south of 24. They presumably nest there, but there are no nest records. Marsh Wrens are summer residents along the large marshes north and south of Fish Lake Road. A nest with two young was along Cedar Creek north of the 24 bridge in 1992.